Thank you Cameron Hughes for sponsoring this post. Capture the celebratory spirit of the holidays, and toast to the season with Cameron Hughes wine! We're seriously digging this stuff, and as it turns out? Super affordable. Check them out! We've got a weird holiday season ahead of us, y'all! Our lease is ending in a couple of weeks and we're selling everything we own and plan to travel west (more on this later). Beau's mom is selling her house which was originally where all family holiday things went down so who knows where we're all gathering. Andddd we've got international travel plans that are going to stretch up almost up to Thanksgiving Day - everything is a little bit in limbo. Whenever life is a bit discombobulated, your options are to either let the paralyzing anxiety of the unknown overtake you... or to get with some of the people that you know and love best for a bit of relaxation and unwinding (un-wine-ding? get it? K). With the holidays creeping up, taking the second route sounded like a smart idea. To keep things as simple as possible, we decided to gather round for Thanksgiving-inspired foods with two of our closest friends in New Orleans (hi Morgan and Chris!). One thing we immediately noticed when building a menu though... no one really makes Thanksgiving recipes for small groups like ours! We tackled this intimate Friendsgiving spread ourselves with three easy fall-inspired recipes that serve four or five people and can be thrown together in just a couple of hours. When you're only cooking for a few, it's so much easier to splurge a bit with items like lobster and forego super traditional holiday fare with equally cozy and soothing dishes like pasta! As part of our partnership with Cameron Hughes Wine for this post, each of the three recipes pair with either their Chardonnay, Pinot Noir, or Cabernet. Easy food and inexpensive good wine? Count us in. 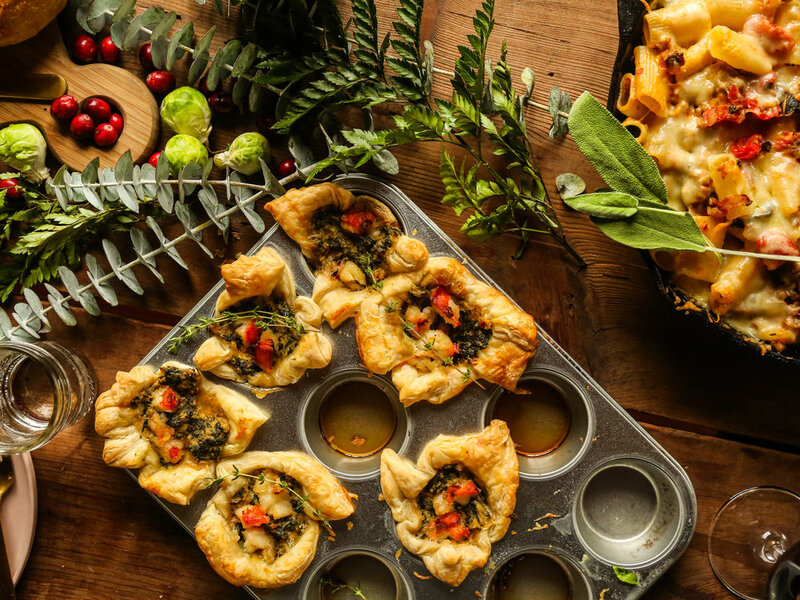 We've got lobster spinach pastry puffs, baked pasta with Italian sausage and tons of sage, and some roasted Brussels sprouts with pancetta and tzatziki. Oh and enough bread to put us all in a beautifully relaxing carb coma! Check out the recipes below! If you're lookin' to get your own wine on, follow this link for 15% off your first order with Cameron Hughes! Bring a 4 quart saucepan filled with water to a boil (enough water to cover the tails). Place the tails in using tongs - wait for it to come back to a boil and then start your timer for four minutes. Tails should be bright red and flesh should be completely white with no translucence (if you do see any raw meat you can just add back to the boiling water until done). Remove from water and let cool. Once cool, completely remove shell and cut the tails into chunks, aiming to have at least 16 pieces. While tails cool, melt the butter in a large pot big enough to hold all of the raw spinach. Add in the onion, garlic, and red pepper and let cook on medium heat for 10 minutes. Add spinach and cook for another 10 minutes, until the spinach has totally lost its shape and reduced - and most of the liquid released from the spinach has boiled off. Transfer to a large bowl an add the cream cheese, sour cream, bread crumbs, and gouda. Mix to combine and set aside. Cut the pastry sheets into four pieces each, leaving you with eight pieces total. Spray a muffin tin with nonstick cooking spray and press the pastry dough into the tins, folding and crimping the edges where there is excess dough. Spoon in the spinach mixture followed by the lobster pieces. Brush the pastry edges with olive oil and bake for 15 - 20 minutes, until the pastry has puffed up and begun to brown. Bring a large cast iron skillet to medium low heat and add in the pancetta. Let cook for ten minutes until most of the fat has rendered. Use a slotted spoon (or a fork) to transfer the pancetta to a heat proof bowl. Set aside. Add the olive oil to the pan and bring to medium high heat. Add the Brussels sprouts, salt, and pepper and sauté for 5 minutes until the sprouts have begun to brown. Add in the pancetta and transfer to the oven. Cook for 35 minutes until the sprouts have begun to crisp around the edges and are tender all the way through. Remove and toss with the apple cider vinegar, serve with the tzatziki for dipping and garnish with fresh dill. Heat a large cast iron skillet over medium high heat and add the sausage, breaking it up into chunks with a wooden spoon. Cook until it begins to brown, about 8 minutes. Remove the meat from the pan, keeping any excess fat or drippings in the pan. Add the olive oil and the onion, garlic, and tomatoes. Cook until onions are translucent and tomatoes have begun to brown, about 10 minutes. Add the sage and the cooked sausage, followed by the milk. Let simmer for 15 to 20 minutes until the milk has thickened and is no longer super runny. Add in half the cheese and give a good stir. Transfer mixture to a large mixing bowl and fold in the pasta until it's all well combined. Pour the pasta back into your original skillet and top with the remaining cheese. Bake for 25 - 30 minutes until the cheese is bubbly and tips of the pasta have begun to crisp. Enjoy!